Spartan Legend Shirley Young peacefully passed away on July 8 after a long struggle with Alzheimer’s disease. The President and Committee of the Melbourne Marathon Spartans Club wishes to extend condolences to Shirley’s husband Ron, her family and friends. Shirley Young built a magnificent record after running her first Marathon in 1978 at the age of 48. She set world age group records at many distances, and was one of the thirteen Legends who completed the first 30 Melbourne Marathons. The graph to the right shows how consistent she was over her career. She ran at a steady pace, many runners regularly experienced Shirley catching them some time after 25 kilometres and inexorably pulling away. She was the most recognisable figure in the marathon, and received support from spectators at all points of the course. Shirley was an inspiration to all, and must have been a factor behind the increase in female participation. 123 women were among the 1947 finishers in 1978 (6%), and in 2011 there were 1338 women among 4956 finishers (27%). Ron Young recently related the story behind this photo published in the 2003 results book. Both Shirley and Ken Elcock were running their 26th Melbourne Marathon, and Ken fully expected that, as usual, he would build an early lead over Shirley, but that her steady pace would mean that she passed him as he slowed. Ron was positioning himself at various spots on the course so he could encourage Shirley as she ran. Each time Ken saw Ron he received a progress report on how far he was ahead. What he didn’t know was that Shirley had been injured and hadn’t prepared as well as in past years. A few kilometres before the finish, it was clear to Ken that he would beat Shirley for the first time. However, for various reasons, it was likely that this would be his last marathon. So, he waited for Shirley and they ran the last kilometres together to jointly cross the line. Click here to go to an ABC TV 7:30 report on Shirley just after her 30th Melbourne Marathon. There are links to a video of the story plus another link to an extended interview with Shirley and husband Ron. Click here to see an excerpt from the 2007 marathon telecast where Shirley is interviewed a few days before the run. Her interview starts about 2 minutes in. Scroll down this page to read Kevin Cassidy’s 2013 article which talks not only about Shirley the runner, but also Shirley the person. The photograph at right shows Shirley sprinting for the finish line in the first Melbourne Marathon. The results book shows her finishing time of 3 hours 50 minutes and 31 seconds, about a minute in front of the third placed woman in her age group. The first Melbourne Marathon was held on the 5th of November 1978, starting in Frankston and finishing at the Melbourne Town Hall. 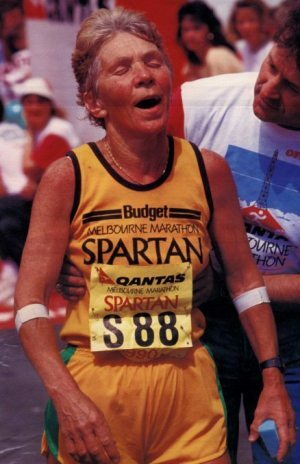 Shirley went on to run the next 29 Melbourne Marathons to become one of thirteen Legends. 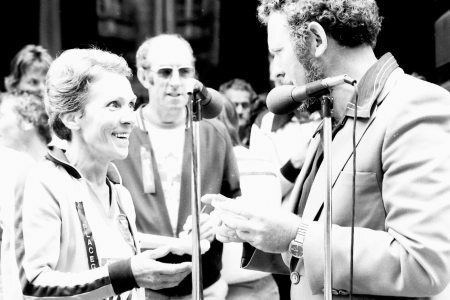 Shirley finished second in her age group in the 1978 Melbourne Marathon, and is shown here receiving her prize from councillor Max Batchelor, Mayor of Frankston. Over the next 29 years, Shirley finished first in her age group at the Melbourne Marathon a staggering 22 times. On at least one occasion she was also first female Spartan. Pete Battrick and Shirley before the start of the 2007 (30th) Melbourne Marathon. His most enjoyable race was four years ago when he paced veteran Spartan Shirley Young to her 30th successive finish. Here is a video showing Pete and Denise Jordan helping Shirley over the line in 2007 and a short interview with Shirley after the finish. 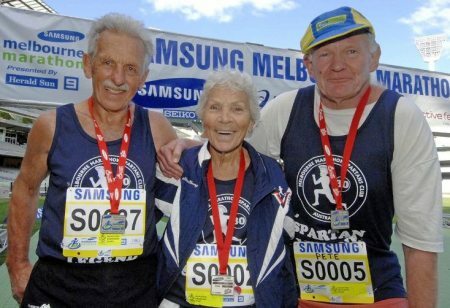 Legends Jack Gubbins, Shirley Young and Pete Battrick with their medals after the 30th Melbourne Marathon. 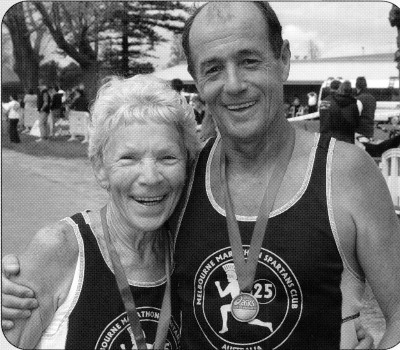 For Jack and Shirley, this was to be their last Melbourne Marathon. The trophies for the fastest Spartans now bear their names, an honour richly deserved. 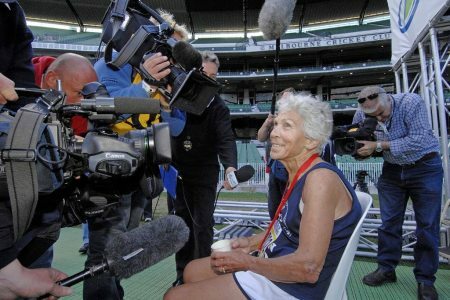 Shirley has the full attention of the media after completing her 30th Melbourne Marathon as the only female legend. Shirley winning her age group in the 1988 marathon. Note that gold singlets were issued to the 88 original Spartans. Her correct Spartan number is SF0002. “This is probably my favourite photo, Kevin”. I’m sitting with Ron Young on a balmy autumn evening at the Collingwood athletic track in suburban Melbourne, perusing a wealth of photos and documentation on Shirley Young’s extraordinary running career. The photo in question is indeed a classic. Shirley had just crossed the line to become the World W55 Marathon Champion in 1987 in a PB of 3:18:38. Not only does Shirley look decidedly satisfied with her run, it also features her husband Ron embracing her proudly. Engaging and talkative, Ron passionately shared Shirley’s career highlights with me. It wasn’t difficult to pick up on Ron’s pride in Shirley’s accomplishments as we reminisced about her incredible journey. Born on Christmas Eve in 1929, Shirley lived the stereotypical life of that era [1950s and 60s] in that she grew up, got married, produced two daughters and filled the role of homemaker while Ron brought home the weekly wage. Sport in the Young household was centred on Ron in those early years. One of the country’s more prominent distance runners, he narrowly missed selection for the 1956 Melbourne Olympic Games in the 3,000 metre steeplechase. Fast forward to the 1970s, Ron and Shirley’s daughter, Lorraine, began making her mark as a race walker, ultimately representing Australia at the 1987 World Athletic Championships in Rome. The popular Tidal River camping ground at Wilsons Promontory was where Shirley began running in January 1977. Aged 47, Shirley would walk down to the beach each day with towels for Lorraine at the completion of her gruelling interval workouts. “Come on, Mum, run down to the end of the beach and back with me”, quipped Lorraine on one occasion. “She’d always lacked confidence and was rather shy but she really grew as her running blossomed”, he explained. As 1977 drew to a close, Shirley had developed into a regular and familiar competitor with both the Saint Stephens and Victorian Masters clubs and was enjoying a rapid curve of improvement. Not surprisingly, a marathon soon loomed in her sights. The inaugural Melbourne Marathon in 1978 was the definitive choice. 3hrs 51min and 31 seconds after the gun, Shirley crossed the line in her maiden marathon, aged 48. No one could possibly have known at the time, but the Melbourne event was to become synonymous with Shirley as she returned year after year. Admiring her from a distance, I’ve vivid memories of the first time I spoke to Shirley. It was in 1984 after the now defunct 10km River Run and she was part of a small group jogging back to our cars at the start line. My immediate impression was of a quiet achiever with a very friendly and unassuming disposition. While Shirley’s success at the 1987 World Masters Championships marathon propelled her name to new heights, it was her initial foray into the ultramarathon world that shook up the record books. Knocking out 63.425km at the 1990 Burwood six hour race, Shirley shattered the W60 world record in the most emphatic of fashions. Over the next twelve years, Shirley’s achievements had record keeping officials around the world suffering substantial doses of writers’ cramp! [computers being in their infancy back then]. As a member of the AURA committee during that period, I can attest that the sorting of paperwork for Shirley’s record claims almost required the hiring of some outside help!!. Affectionately known as “Nana” by her closest running friends, Shirley churned out quality ultra performances with amazing regularity. Personally, I got to share the track and road with her on more than the odd occasion, a fact for which I feel most privileged. Bereft of ego and with absolutely no tickets on herself whatsoever, Shirley genuinely saw nothing special in what she did and could never understand the attention she received, a quality that gained her even greater respect and admiration among her peers. “I let Ron look after any records”, was her typical deflection to the constant praise that came her way. “I just love to run and I’m going to run a marathon when I’m 100”, she would laugh. Shirley didn’t confine her talents to the ultra world. She continued to churn out standard length marathons as well as collecting numerous Australian titles over any distance from 1,500 metres to 10km. A significant highlight was her swag of medals at the 2001 World Masters Championships in Brisbane. Shirley’s list of World and Australian records below is somewhat lengthy so perhaps it’s time to pause, make a cup of coffee and find a comfortable chair before digesting what follows. Midway through 2002, misfortune struck as Shirley was diagnosed with the early stages of alzheimers, a situation that substantially curtailed her record breaking spree. 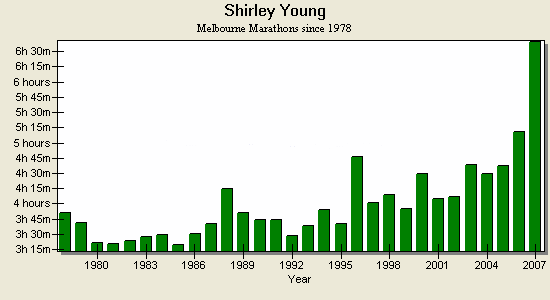 Regardless, Shirley continued her unbroken streak at the Melbourne Marathon and in 2007 became the only female among the 13 individuals to finish all 30 editions of the race. Amazingly, she did this barely eight weeks after breaking two ribs in a fall. Her attempt at finish number 31 in 2008 came to an end at 33km when she cramped in her hamstrings. 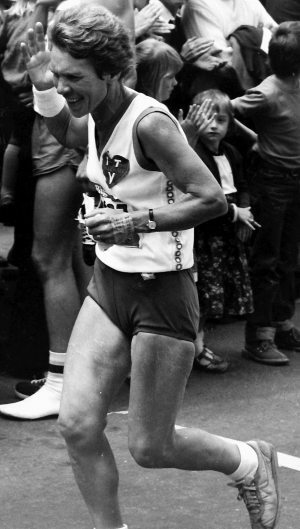 In all, Shirley ran 72 standard length marathons in and around her ultra career. Ultimately, the 2008 Melbourne Marathon proved to be Shirley’s final run with the Adelaide six hour event in 2005 bringing down the curtain on her ultra career. Looking over Shirley’s impressive CV, Ron was in no doubt when I asked if any one performance stood out. “The 2000 Coburg 24 hour was clearly her signature performance. In fact, Andy Milroy [international ultra statistician] was firm in his conviction that he would never see another 70 year old woman do something like that in his lifetime” beamed Ron with understandable pride as I nodded in agreement. Meeting Gary Parsons for the first time at the sad occasion of Bryan Smith’s funeral in 2001, Shirley was flattered to learn that Gary would think of Shirley every time he had to dig deep during his 19,000km run around Australia. Having known Shirley and Ron for a lengthy period, one thing that stands above all is their life long devotion to each other. It truly is one of the great love stories. Now aged 83, Shirley has resided at the Anglican aged care centre in the Melbourne suburb of Box Hill for some time now and has spent the more recent months confined to a wheelchair. Ron spends most part of each day there. Climbing into my car, Ron bid me goodbye with his usual enthusiasm, positive outlook and upbeat manner. He always sees the glass as being half full. As for Shirley’s plan to run a marathon at 100, don’t write it off just yet.